Beautiful villa built on a plot of 1000m ², surrounded by walls and fir trees, built on two levels, new furniture, large bright living room, large fully equipped kitchen, beautiful terrace with barbecue and garden furniture, 3 comfortable double bedrooms with wardrobes + 1 room office, 1 bathroom + WC and 1 shower room + WC, television 35 channels, WIFI and computer available, large garden, partial garage, laundry, pool 18 m², parking two cars in property, shed. Possibility to rent linen. Near the small rustic village of Badens. 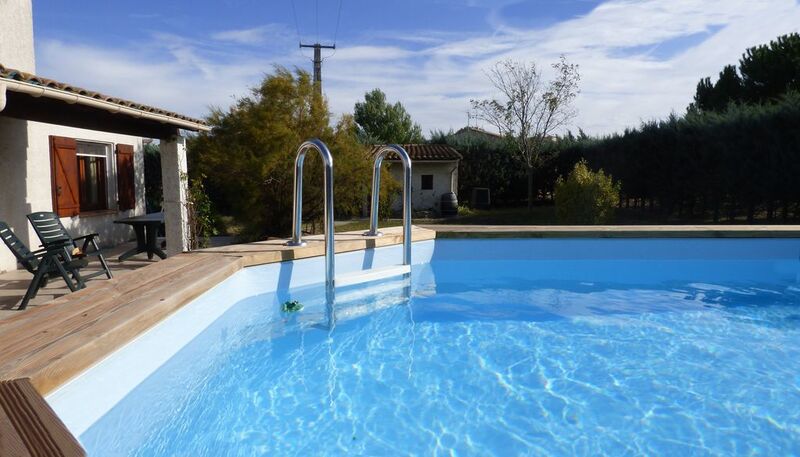 5 km from Trebes (shops, services, restaurants). 13 km from Carcassonne (city). A 13 km from Lake Cavayère (beach, water games and ski lift). Property completely surrounded by walls and hedges of spruces. Internet, WIFI (Free WIFI connection), satellite TV 30 channels, washing machine, dishwasher, microwave, oven, vacuum cleaner, iron, radio CD, TV, barbecue. Possibility to rent bed linen for 15 euros per bed. Trebes (6 km): Intermarché, Bricomarché, Super U, shops, services, restaurants, swimming pool, market, banks, tourism info. The household is obligatorily done by persons delegated by the owner. La villa est fonctionnelle et comme décrite dans l'annonce !! Hôte très accueillant et de bons conseils pour visiter la région. Nous recommandons cette location !!!! Quiet on the edge of a small picturesque village surrounded by vineyards, yet close to everything ... Supermarkets, services and restaurants at 6 km, and not far from a real beach 15 km, or those of the Mediterranean 55 km by fast track. Beautiful villa 120 m² built on a plot of 1000 m² closed walls and firs, built on two levels, new furniture, 3 double rooms well equipped and comfortable, 1 bedroom office with Internet Wifi and computer available, 1 bathroom and 1 shower room, large bright living room (TV 30 channels, radio / CD), large fully equipped kitchen (oven, microwave, dishwasher, food processor, coffee percolator), laundry (washing machine, vacuum cleaner, iron iron), above ground pool 20m² (5.6x3.5), barbecue, garden furniture, parking 2 cars in the property. - 55km from the 84 beaches (Gruissan, Narbonne-plage, Port Leucate). A complete 'book' containing a complete description of 160 sites to visit in the region is at your disposal.